Loudoun: The happiest place on Earth? “Most folks are about as happy as they make up their minds to be,” Abraham Lincoln once said. If that’s the case, then it seems Loudouners consistently choose to be content. SmartAsset, a New York-based financial technology firm, last month released its official ranking of “The Happiest Places in America,” and Loudoun took the crown. 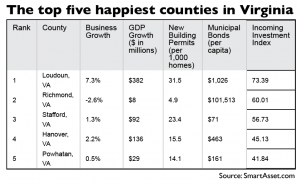 Listed are the top five happiest counties in Virginia. What does it mean to be happy? Personal definitions of happiness are expansive. Some measure it based on success in marriage, family planning, the obtainment of professional goals or robust participation in charitable works and community building. Considering the number of sweeping variations, it’s difficult to believe this adjective can describe one location in particular. The firm’s analysts addressed this issue by identifying eight metrics to compare one county’s happiness level over another. Despite Loudoun’s population nearly tripling within the last 25 years, it still outranked approximately 1,000 counties in the study in six of the eight metrics considered. The metrics were organized into four categories and weighted equally: family stability (marriage and divorce rates); physical health, which namely focuses on life expectancy and the percentage of population who regularly exercise; personal financial health, including bankruptcy rates as well as the ratio between median and minimum income; and economic security, (average unemployment and poverty rates between 2009-2013). Loudoun’s 3.6 percent poverty rate is the lowest of any major U.S. county. Its marriage rate ranks eleventh at 62 percent and residents have an average life expectancy of 83 years-old, which tallies sixth overall. “Loudoun County is very proud of all of the things that it offers its residents, such as a quality, award-winning government; quality schools; great communities in which to live; and a healthy job market,” said Glen Barbour, Loudoun’s public affairs and communications officer. While Loudoun scored markedly well in areas the firm considered to be most important –GDP growth, upticks in new business licenses, building permits and municipal bond investment, SmartAsset’s Kara Gibson wrote in a statement to the county – its softer skill attributes are what shine for the residents who live here. Although it sits in the outskirts of Washington, D.C., which is one of the most congested cities in the nation, the county “feels like a perfect escape with its rolling countryside, farms, historic estates and gardens,” said Beth Erickson, chief executive officer at Visit Loudoun, the county’s tourism bureau. Happiness knows no boundaries. Virginia also takes the crown as the happiest state in the nation with three of the five most happy counties situated in the Commonwealth – cheers to Fairfax and York counties, as well.